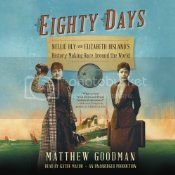 November 14, 1889, Nellie Bly set off to travel around the world in less than eighty days, an attempt to break the record set by Jules Verne’s fictional character Phileas Fogg from the novel Around the World in Eighty Days. Bly’s travel was paid for by the paper she worked for, Joseph Pulitzer’s World paper in New York. Although the idea originated with her, by the end of the day Nellie Bly was not the only young woman traveling around the world. The publishers of The Cosmopolitan decided to send Elizabeth Bisland, who wrote a books column for the magazine, on her own journey heading west instead of east, in at attempt to beat not only Phileas Fogg, but Nellie Bly as well. I love it when authors find fascinating historical events about which I know nothing and tell it really well. I knew a bit about Nellie Bly before Eighty Days, but interestingly not about her race around the world. My knowledge was limited to her expose on the insane asylum on Blackwell Island, a reference it is possible I learned from my massive The West Wing marathon earlier this year. Goodman lays his story out very clearly, alternating between the two women’s stories in a way that is faithful to the timeline while still maintaining a good flow. While the book itself is rather long, it has a good pace and is continually interesting. Kathe Mazur does a wonderful job narrating. Like Goodman’s writing itself, she maintains a good pace and, while she doesn’t do much vocal differentiation between the stories, it isn’t really necessary or called for here, and there is no problem keeping the narrative straight. A long book, but well worth the read. Fascinating and highly recommended. A race around the world in 1889 does sound fascinating! Ok, this doesn’t happen often, but I swear I’ve read this book. But it’s new, and that can’t be. I even did a search for other books about Nellie Bly, but I couldn’t find a familiar title. But as to your review, yes, I love when authors pick up on some historic event that needs more coverage. So fascinating. Thanks so much– I thought this book was fascinating and beautifully written. I am so happy to see it get such a great response. 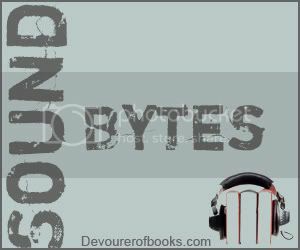 And thanks for all you do for Audiobooks. It means the world to us to have such intelligent and thoughtful listeners and reviewers.